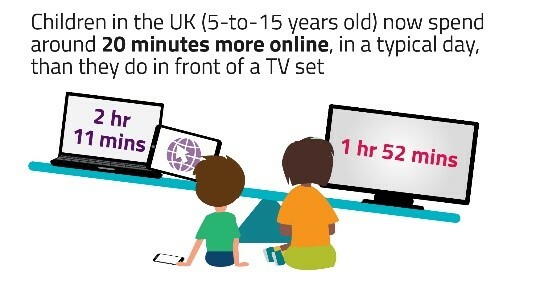 Children in the UK (aged 5 to 15) now spend around 20 minutes more online, in a typical day, than they do in front of a TV set – just over two hours online, and a little under two hours watching TV – according to Ofcom’s annual study of their media use . “Children have told us in their own words why online content captures most of their attention. These insights can help inform parents and policymakers as they consider the role of the internet in children’s lives. Ofcom’s national, quantitative research also finds that older children are finding it harder to control their screen time than they were last year.